The next installment in the popular truck simulation game series with an additional economic layer. The product was created by Czech studio SCS Software, who previously created its sister game - Euro Truck Simulator - and the 18 Wheels of Steel franchise. American Truck Simulator for PC is a simulator of driving a truck created by by Czech studio SCS Software. It has a lot of experience in this genre – the studio is also responsible for similar 18 Wheels of Steel and Euro Truck Simulator series. The game allows us to drive massive 18 wheelers across North America. We are freighting various goods and we have to make sure that cargo will reach its destination point on time. Developer payed attention to recreating the road map faithfully so we can drive on the most important highways and expressways in USA and Canada, connecting most of their transit cities. American Truck Simulator for PC allows us to pass a branch’s typical career – from common trucker working for some company to boss of his/her own transport company employing dozens of drivers. One of the most important elements of the game is available trucks – we can drive vehicles from manufacturers like Peterbilt, Mack or Freightliner which are popular in North America. Trucks have very precise models, created with lots of details. 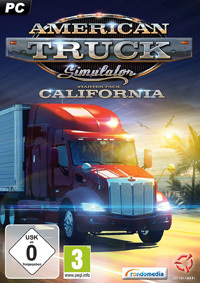 American Truck Simulator for PC was based on modified SCS Software’s engine which was used also in games such as Euro Truck Simulator 2 or Euro Coach Simulator. It guarantees smooth running of the game as well as detailed cities, recognizable thanks to many characteristic buildings. Game score 8.29 / 10 calculated out of 1087 players' votes. Expectations before the premiere: 9.4 / 10 calculated out of 1690 players' votes. All most important aspects of American Truck Simulator, the newest truck driver simulator game, are described in this guide. We waited for so long for American Truck Simulator and it's heading to stores as we speak. This game shows how a proper truck sim should look like. ETS 2 can finally rest in peace. The playable demo of American Truck Simulator showcased on gamescom was an undeniable proof to many that the game’s release is at hand. Unfortunately, the rumors of its imminent debut have been greatly exaggerated.